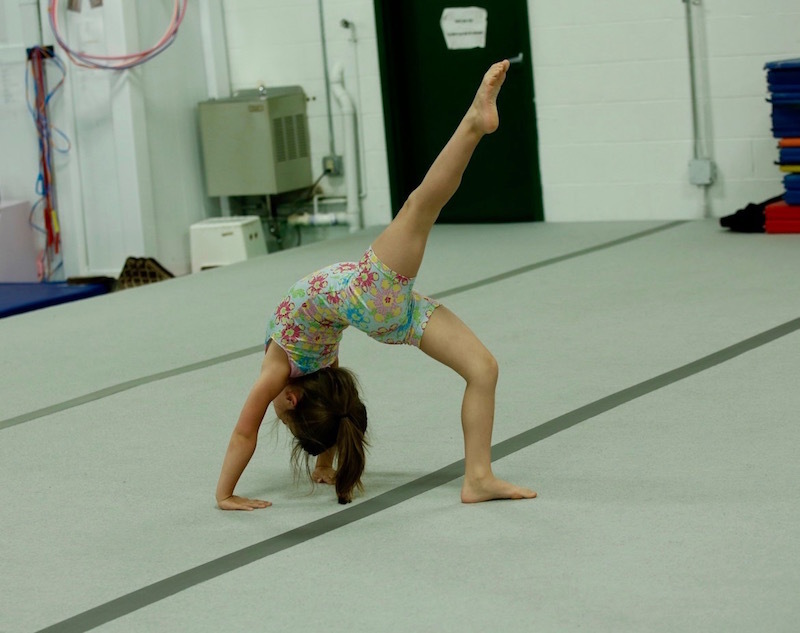 Gemini Gymnastics Academy has classes for all age groups, including gymnastics, tumbling, (new!) ninja classes, and yoga. They use the Powerful Words Character Development Curriculum, developed by a Child & Adolescent Development Specialist, which encourages the kids to contribute to our wonderful community in a positive way, all while having fun and learning gymnastics and tumbling skills! Gemini also offers open gym and birthday parties. Read about all of their fun offerings below and click here to be taken to their Parent Portal to register online. Gemini Gymnastics Academy was established June 13, 2005 by Chris Kozelka Campbell. they specialize in recreational gymnastics for ages 2 and up, an Xcel Team, and is a USA Gymnastics Member Club. In January of 2010 Chris and her sister, Carrie Johnson, teamed up to run the business together. They are both moms who understand how teaching children can touch their lives for years to come. In fact, many former students have such fond memories from working with them during their younger years as gymnasts that they return to Chris and Carrie to teach at Gemini years later! 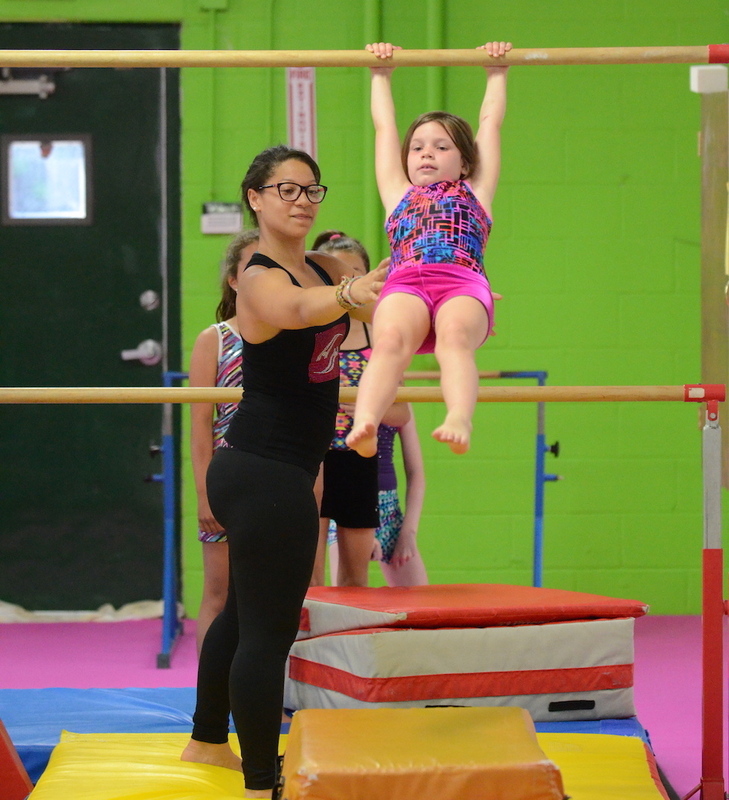 The goal at Gemini Gymnastics Academy is to provide a nurturing and positive atmosphere where your child can receive quality instruction and individual attention. Gemini believes that the sport of gymnastics can build self-confidence, teach life skills and create happy, healthy children. What sets Gemini apart from other children’s programs is that they use the Powerful Words Character Development Curriculum to enhance your child’s learning experience by helping them develop socially & cognitively as well as physically! Child & Adolescent Development Specialist, Robyn J.A. Silverman, PhD has developed their character education program that is used within the context of their organized tumbling & gymnastics lessons. The program invites students to listen, share, discover, and reflect on the ways to become upstanding members of our community as well as confident individuals in their own right. Child development experts know, for preschoolers & kindergarteners, acquiring healthy learning attitudes are far more important than mastery of specific skills. Gemini’s Tiny Twistar curriculum is carefully designed for exactly what children need most during these formative years. In the Tiny Twistars program, gymnastics skills are used as tools to teach learning attitudes while skill mastery is a secondary goal. Twinklers is a 30 minute class for children ages 2-3 years old. This is the only Tiny Twistar level where children may move up to Sparklers upon turning 3 with teacher recommendation. This class is taught with comfort, meaning that a parent/caregiver may be in the gym to help their child begin to participate if necessary. As soon as the teacher feels your child is ready to participate solo, please enjoy the view from our lobby. Classes concentrate on balance, coordination, gross motor skills and locomotive development in a fun, bright and exciting atmosphere! Sparklers is a 45 minute class for children ages 3-4 years old that have turned 3 by September 1, 2016. Classes concentrate on balance, coordination, gross motor skills and locomotive development in a fun, bright and exciting atmosphere utilizing obstacle courses on floor, balance beam and bars. Super Stars/Super Novas is a 1 hour class for children in 4-5 year old preschool and kindergarten that have turned 4 by September 1, 2016. Classes are geared towards the increasing attention span and motor development of this age group and concentrate on balance, coordination, gross motor skills and locomotive development in a fun, bright and exciting atmosphere utilizing obstacle courses on floor, balance beam and bars. At Gemini, they emphasize correct technique by deconstructing skills into manageable parts to maximize each student’s success and learning potential. The emphasis is not on who’s the fastest, the strongest or the best, but on the adventure of growth and learning. In Level 1 girls in kindergarten  and up will be performing at a fundamental level of gymnastics on vault, uneven bars, balance beam and floor exercise (tumbling). This 75 minute class provides the solid foundation for more difficult skills to be learned as students gain strength, flexibility, coordination and confidence. In Level 2, girls in 1st grade and up will be using progressions to build on the fundamental skills acquired in Level 1 gymnastics on vault, uneven bars, balance beam and floor exercise (tumbling) during this 90 minute class. Gemini also offers Silver and Gold Gymnastics/Xcel Team, levels for girls with instructor approval. Class times are listed on the portal but please email them to register for this level. Students can choose to take classes only or compete on the Silver or Gold Xcel Team. In Beginner Tumbling, boys and girls in 1st grade and up will be learning the fundamentals of floor exercise (tumbling) skills. This 1 hour class provides a solid foundation for more difficult skills to be learned as students gain strength, flexibility, coordination and confidence. In Intermediate Tumbling boys and girls in 1st grade and up will be building on the fundamental level of floor exercise skills (tumbling) they’ve acquired in Beginner Tumbling. This 1 hour class works on strength and progressions to facilitate learning handstand skills, limbers, walkovers, round-offs and handsprings. In Advanced Tumbling boys and girls in 1st grade and up will be building on the fundamental progressions of floor exercise skills (tumbling) they’ve acquired in Intermediate Tumbling. This 1 hour class works on progressions to facilitate learning round-off back handsprings, multiple handsprings in succession, saltos as well as aerials. In this 1 hour class, boys and girls can learn Beginner & Intermediate level tumbling skills comfortably while grouped with students similar in age. This 75 minute class provides a solid foundation for older girls to explore gymnastics with students of similar age. Students will work at their own pace on vault, uneven bars, balance beam & floor exercise (tumbling). More difficult skills will be introduced as each student gains strength, flexibility, coordination and confidence. 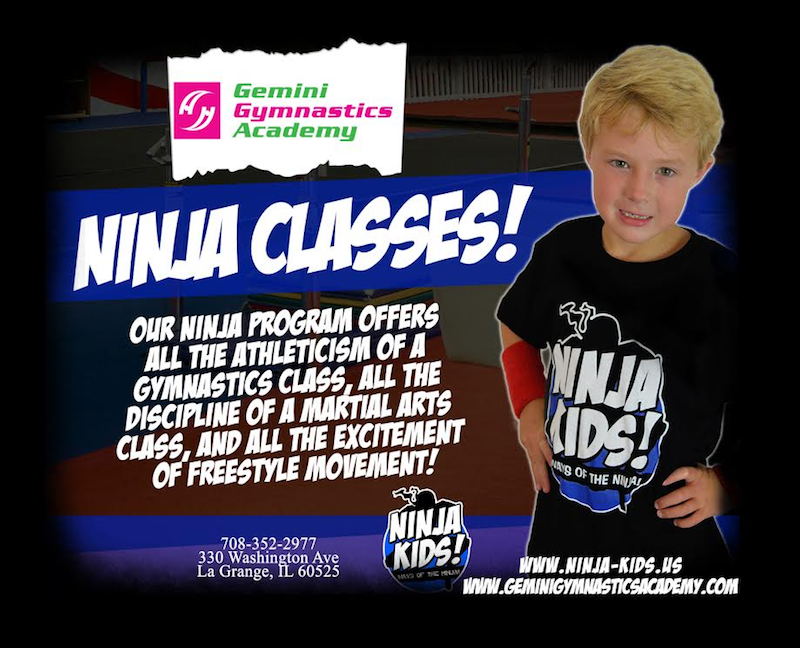 The Ninja program offers all the athleticism of a gymnastics class, all the discipline of a martial arts class, and all the excitement of freestyle movement! Young Ninja’s learn flexibility, strength, tumbling, obstacle maneuvers, and the discipline found in martial arts. 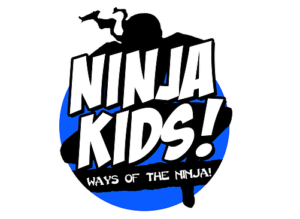 This hour long class is perfect for highly active boys and girls who are looking for a fun recreational activity where they can learn true ninja style movements and techniques, all within the confines of a safe and controlled environment. All Ninja Instructors are certified and trained via our comprehensive training and practical application testing. There is also a yoga program, Stardust Yoga Studio, which offers classes for toddlers through adults! Toddler yoga is a rare opportunity to play, focus and learn new things without worrying about doing it right. This class is designed to build self-esteem and foster a parent/child connection. Benefits for both parent and child include increased flexibility, refined balance and coordination, development of focus and concentration, boosted self-esteem and confidence. Children will participate in a fun yoga class with asanas, sun salutations, yoga games, stories, guided relaxation, meditation, and art! Participants will learn essential elements of yoga that will increase strength and flexibility as well as stress reducing techniques. This yoga class for older kids will include breathing techniques, flowing yoga asanas (poses), guided relaxation with visualization, and meditation. Learn techniques to enhance focus, balance, calm, and present moment awareness while gaining strength and flexibility. Creative expression with a variety of art materials will follow meditation at the end of class. Tiny Twistar Open Gym is a fun, special time to come play and practice gymnastics skills with your little one & one of GGA’s staff members! Offered Monday through Friday 11:10 am-12:10 pm during the school year. Friday Night Open Gym is for children first grade & up can practice their gymnastics skills under the supervision of two GGA staff. Children under first grade are welcome to attend with a parent/caregiver supervising them in the gym at all times. Offered most Fridays 7-8:30 pm during the school year. Check the Gemini website for excluded dates. Parties are $250 for up to 15 children & require a $50 deposit to reserve your date/time. Gymnastics parties, for children turning 5 and up, provide 90 minutes of pure fun for kids & ease for parents! Gym time includes a warm up, safety rules & obstacle course where activities are geared to the ability of every child. A variety of group games and a balloon drop (with an Open Gym Pass for each party goer to return for more fun!) completes the time in the gym. Finish in their Party Room with any food items you provide. Invitations, apple juice, cups, table cloths and markers to color are provided. Yoga birthday parties, for children turning 5 and up, include a yoga class with music, games, relaxation and a craft! Parties can be based on a theme or introduction to children’s yoga. If you have a specific theme in mind, please mention when booking your party and they will gladly accommodate your request to the best of our ability. Finish in their Party Room with any food items you provide. Invitations, apple juice, cups, table cloths and markers to color are provided. This post brought to you by Gemini Gymnastics Academy. Kidlist welcomes them as a sponsor and is proud to have them on the site! Be the first to comment on "Gymnastics, Tumbling, Ninja Classes, Yoga, and More at Gemini"